A blog title like that could apply to a lot of topics; I’ve got some Bondo™ work to do on my 14-year-old minivan this spring to try to stem the tide of body-rot that’s appearing along the edge of the frame under the passenger-side slider, the lawn is coming in splotchier than usual after the heavy snow and collateral damage to the grass done by the abundance of snow-melting chemicals (I don’t think they use rock salt on the roads anymore), the deck is in dire need of a power-washing (to get all the spent sunflower seed shells out from between the decking boards) and a re-sealing with waterproof deck stain. 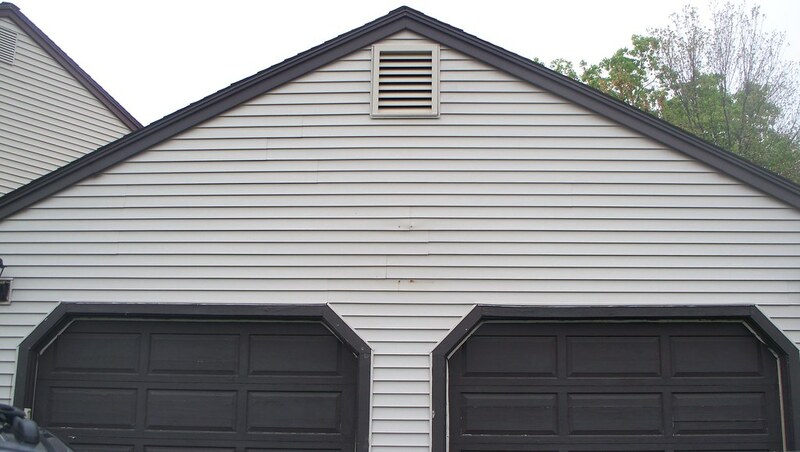 But this time around, the target of my words are the gable vents on either end of the garage, up by the roof peak on both the front and the back. 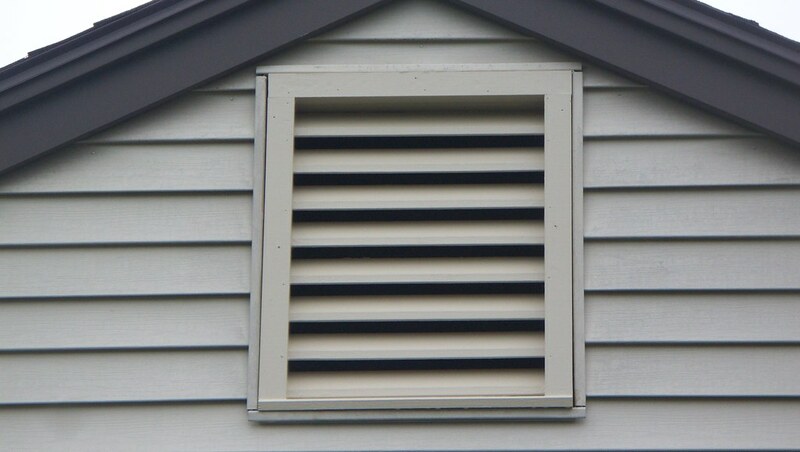 Both vents fatigued and failed the same winter. One faces mostly south, the other faces mostly north; it didn’t matter. They both looked like they were attached to an old abandoned haunted house somewhere (see photo). I had seen the deterioration starting mid-winter, and watched it getting worse week-by-week. I knew I would have to replace both of them come spring, so I started hunting for a pre-fabricated replacement. The original ones (installed when the garage was built 26+ years ago) had all the earmarks of being a pre-fab drop-in item (assembled with staples instead of nails, a box-like structure, etc.) so I was hoping that they were still being made and I could buy drop-in replacements. The more I searched, though, the more I came to the conclusion that I would have to custom-make the replacements. 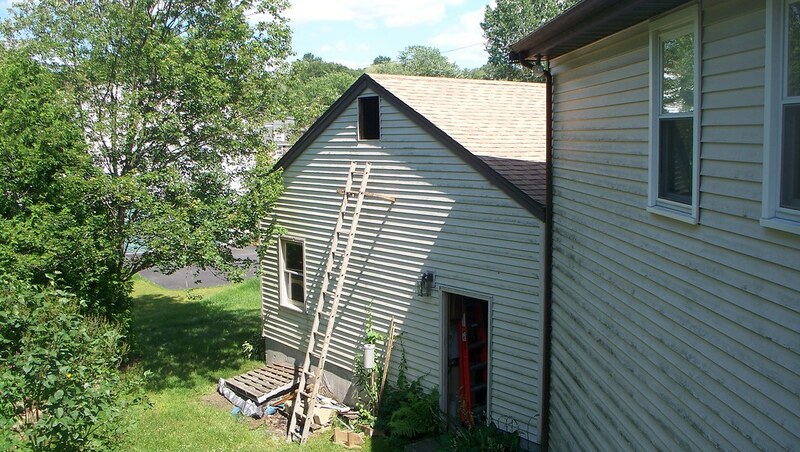 I had no doubt that I could do it, I just would’ve preferred a drop-in replacement rather than spending all my time going up and down the ladder with pieces, building each one by hand from the top of the ladder. So yesterday the process started. Up the ladder I went and dis-assembled the remaining pieces of the south-side vent on the driveway side facing the street. I had to disassemble and remove the basketball backboard first as it was in the way of the ladder and prevented me from getting easy access to the vent, so my vent demolition was delayed until later in the morning than expected. 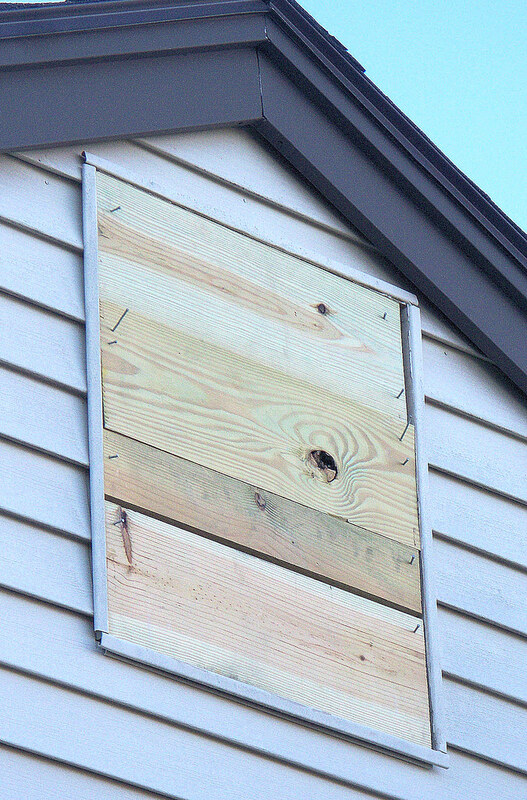 The backboard had to be removed in segments (first the rim, then the fiberglass backboard, then the mounting bracket) because the upper toggle bolts were unreachable from a ladder on either side. Once the backboard was out o the way, I pulled the remnants of the vent out, then headed off to grab some lunch and stop at a local building supply/lumber yard to get some new bolts to re-attach the rim to the backboard (I had found a taker for the backboard assembly through a local “freecycle” email mailing list). 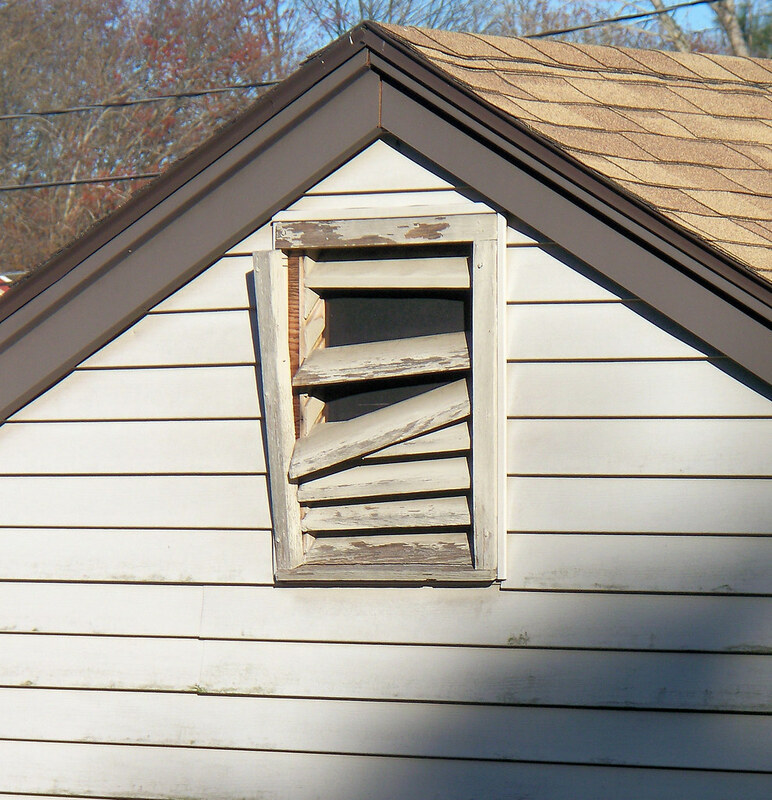 Once at the lumber yard, I tried one more time to find a drop-in replacement for the vents. SHAZAMM! They had two in stock! And it looks like it’s the same manufacturer because they were assembled exactly like the old ones, and they’re a glove-fit! They cost less than I would’ve had to pay for the wood itself, never mind the time I’d spend building them! I was ecstatic! 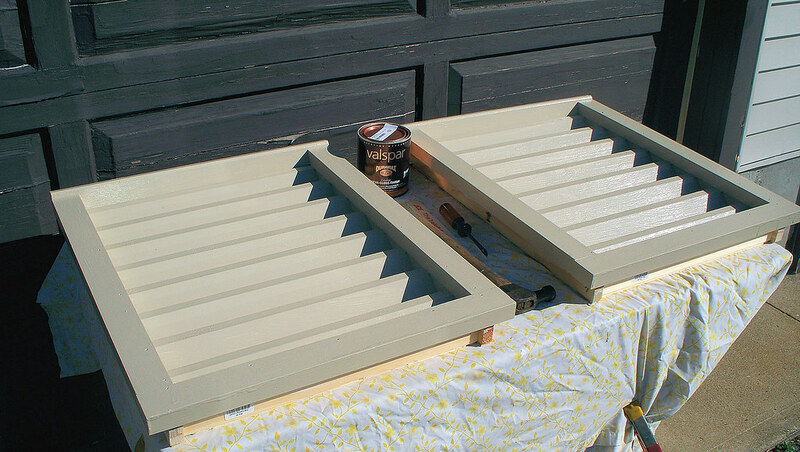 So I boarded up the now-open vent hole to keep the birds out of the garage and commenced painting the pre-assembled vents (primer and two coats of almond-colored exterior paint) so I could pop them in all assembled and painted the next free weekend! I was so happy I could’ve danced a jig! this weekend (14 May). It looks great, and the computer-color-match paint system at Lowe’s was able to match the vinyl siding color pretty darn well! 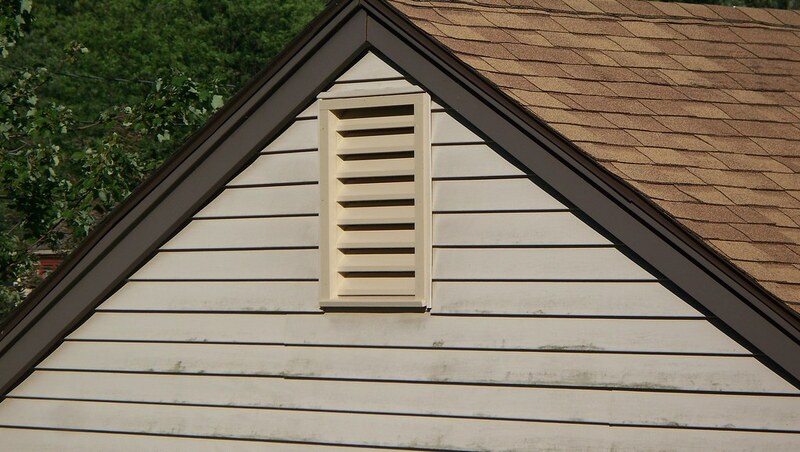 Finally got a weekend (July 9 & 10) at the southern house with decent weather (lots of rainy weekends recently) so I could finish the gable vent replacement. The north side is now back to normal, rather than looking like a haunted house (see the very first picture at the beginning of this post)! I had to move some of the pallets I’ve been “saving” to be able to place the ladder, and the vent itself needed some free-hand table-saw “modifications” to get it to fit in the existing cut-out from the old vent, but nothing too elaborate or risky. Now the garage is back to normal! This entry was posted in General, House, Spring, Yard Work. Bookmark the permalink.